Before we head off to England (and a five day side-trip to Northern France) to visit the across-the-pond family, we wanted to leave you with a different option for your Christmas Day meal. Some families love making hard-core meals for Christmas Day dinner – meals that take hours to cook and include many courses or many side dishes. If that is your type of meal, then you may want to save this recipe for another time (perhaps when you’re hung over on New Year’s Day?). This dish is so flavorful and so freaking easy to make. You know what makes it even better? It’s a cost-effective. So chat with your butcher, make it easier and just ask him/her to butterfly that pork for you, grab a huge mug of egg nog or mulled wine, throw on some Johnny Mathis and spend some time doing what real Americans will be doing – hanging out with Ralphie. MERRY CHRISTMAS/HAPPY HANUKKAH/HAPPY KWANZAA EVERYONE! Thank you for supporting us, commenting on posts and actually reading our words. It means more than you know! Have a delicious 2010! How to shell the chestnuts: With a knife, make and “x” on one end of each chestnut. Bring water to a boil and boil chestnuts for 15 to 20 minutes. The chestnuts will be soft. Peel the chestnut shell off, starting where you placed that “x”. You may also choose to roast your chestnuts by cutting the “x” again at the top and then roast for 15 to 20 minutes in a 400 degree oven, shaking the pan every five minutes. Time to make the pork! Preheat the oven to 450 degrees. In a bowl, combine the sausage meat, egg, and 1/4 cup of the breadcrumbs. Mix well and add more breadcrumb if mixture is too wet. Sprinkle the butterflied pork with salt and pepper. Spread the sausage mixture over the whole butterflied pork, leaving a 1/4 inch space on each side. Sprinkle the pistachios and chestnuts all over the sausage – push a bit into the sausage mixture. Roll the pork up like a cigarette/joint and get your twine ready to be used. Now, tie up your roast. Sprinkle pork with the four spice (it’s strong in flavor, so a little goes a long way), rub with olive oil, place in the roasting pan and into your oven. Roast the pork, at first, for 10 minutes at 450 degrees. Set a timer to remember to turn the oven down after 10 minutes to 250 degrees. 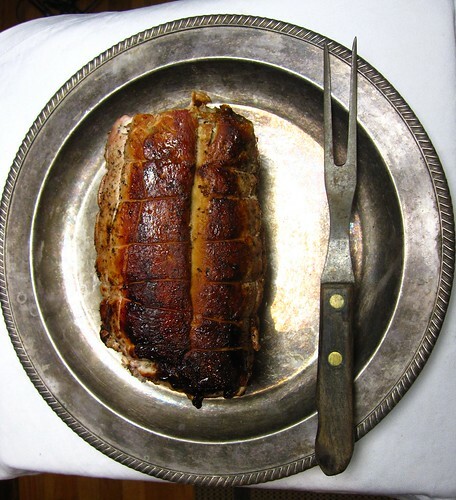 Depending on the size/shape of your pork loin, it will cook for anywhere between 50 and 80 minutes (remember – this is cooking time for a pork tenderloin) or until it reaches an internal temperature of about 150. Take out of the oven when it has reached temperature, allow to rest under some tented foil for about 15 to 20 minutes. While pork is resting, make the cider gravy. With the pork roasting pan on your stove top, deglaze the pan with the cider and allow to cook down for a few minutes, picking up all the goodness from the bottom of the pan. Pour this into a cup or small bowl and allow to sit for a few minutes. Using a baster (or, more tediously, a spoon), remove the fat from the lean part of the gravy. Add gravy back to pan, reheat on low and taste to add some salt and pepper. Add the sour cream and blend with a whisk. When sauce comes up to perfect temperature, it’s ready to be served. Slice pork with a sharp knife – about 1 1/2 to 2 inches thick. Pour gravy over pork and enjoy! Excellent job on the roulade, the plating and the photography. It looks perfect! Oh, yeah! That looks super good. This looks delicious, I especially like the cider sauce… lovely photos. Oh, yeah. That’s my kinda pork. Love an easy main dish that doesn’t take forever to cook. Of course those Romanesco “trees” are pretty snazzy too. And so tasty. I’ve got the last of the local romanesco in my fridge right now. I love this recipe, it’s going straight into my bookmarks! It looks really impressive and sounds delicious too! Gorgeous roulade, look absolutely delicious. Love the rustic look on your serving dish! Have a great trip, guys! A perfect-sounding stuffing and gravy stuffed into pork…need I say more? Have a great holiday visit/vacation. I’m sure you’ll come back with lots of fodder for interesting posts in 20-10. You guys really know how to pork a log. Or log some pork. Just think how much weed you could fit in that if it really was a joint… not that I’m advocating it, because it’s illegal. I made cider gravy recently too- it must be something in the fall air (besides winter’s frigid fist). This is a stunning holiday dish! I love the enticing addition of pistachio, chestnut and who could refuse the hard cider added! Great job! Wow, this is an outstanding dish! I’m loving the stuffing with pistachios and chestnuts, fantastic! Have a wonderful trip, happy holidays! This is what I want for Christmas! I would love to see this on my Christmas table. I think I found the new star of my table! Move over,spicy ham! What a lovely dish. May I suggest degel recolte 08 for your cider? I find it has a smooth taste, not so bitter as some ciders are. The chestnuts are lovely, and I normally roast them instead of boiling them. I will have to try and see if the boiling method is better! I see I’m not the only one “stuffing”~the roulade looks gorgeous – tied very well! Have a wonderful holiday and a delicious vacation! Thanks for letting me know what I want for dinner tonight. That looks beyond delcious. <3 <3 Sausage, pork and pistachios – 3 of my favorite things! Excellent recipe. Love Roulades. Happy Holidays and safe travels. I was pretty sure I wouldn’t find a chocolate yule log or cookies here. Looks pretty wonderful, extraordinary really, beautiful, I mean that. So Happy christmas to you both, have a good time the the UK and then France !! !eat drink and be merry. Looks very tasty! Pistachios and chestnuts is a delicious combination. Nice, that’s my kinda yule log too! Chestnuts always seem very festive to me, and the gravy looks delicious. Happy holidays to you both. We were supposed to be in NYC by now, but the storm has put the kibbosh on that plan. Still hoping for at least 1 night in the city. Must be beautiful right now. Have a great trip (France! I am jealous.) 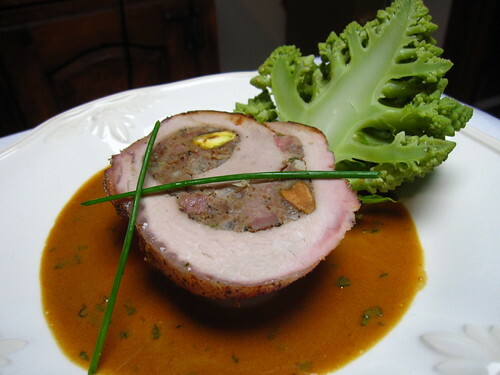 Love the pork roulade idea. Joyeux Noel. That looks nothing short of divine. Have a great holiday and have fun on the other side of the pond! So perfect for the holiday season. Have a wonderful holiday and Christmas with family and friends across the pond. I know your kitchen will be filled with successes. Yay for roulade! I love jazzing up meat by rolling it in other ingredients. I’ve mostly used chicken, but never tried pork before. 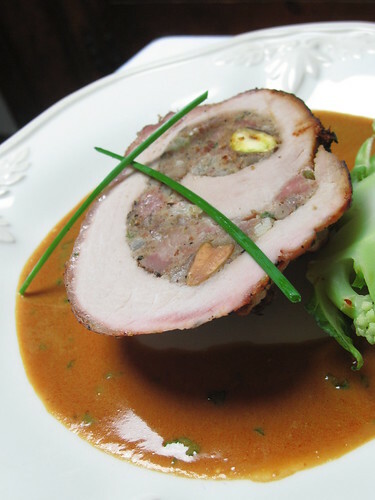 Your pork roulade looks so fancy… YUM! HAPPY HOLIDAYS!!! Gorgeous holiday dish! Love every part of it. Have a great time and Happy Holidays! have a very merry xmas, with all that traveling i am rather jealous of your food and fun! love it! I hope you two have a happy new year and a great trip there and back. This looks like an absolutely fabulous recipe. I love that photo on the silver platter. Wishing you a dazzling New Year and safe travels! Oh yeah, this is a roulade to cherish! Not only does this look and sounds delicious, but the key picture resembles an upside down panda’s face.